Do you own a dog? Do you like to hike and backpack? Then this site is for you. Nothing beats taking a hike in the lap of nature. Getting away from the hustle bustle of daily life and enjoying life in its natural state- we all should opt for hiking once in a while. Of course, regular hikes help us remain fit as well. The best companion for a hike is your pet dog. Dogs may have been domesticated by man but they still are better than us when it comes to the rough life of the jungle. You will have a loyal ally by your side if you take your pet dog along. There are many instances where pet dogs saved the lives of their owners after mishaps during hiking. • Make sure your pet dog is healthy enough to accompany you on the hiking trip. Take your pet dog to your veterinarian and get your dog checked. Never take an unhealthy dog on such a trip. You will face numerous problems if your dog falls seriously ill.
• Make sure your pet dog is acclimatized for the hike. We take lots of precautions to protect our feet and other body parts from excessive strain during the hike. You cannot get shoes for your pet dog. The next best thing is to make sure the dog is used to the strain. • The best way to condition your dog is to take it for long walks on a daily basis. Start out with a short distance and keep on increasing the distance until you are sure that the pet is ready for the hike. • You can also resort to activities like jogging, tennis-ball fetch, and swimming to get your dog into good shape. • After conditioning the heart of your pet, take care to toughen up the toes. The pads of your dog’s foot should be capable of bearing the strain. A dog with a bleeding foot pad can become a very heavy burden on the hike. • Prepare your dog’s ID tag and license and make sure the rabies inoculation is up to date. Get your vet to insert a microchip to ensure your pet dog can be found very easily. • Never forget the fact that trail restrictions are for your safety. Ignore them at your own peril. If the trail requires the dog to be put on leash, obey the rule. Further, make sure you clean up the mess caused by your dog on the trail. Respect the ‘No Dogs Allowed” sign. Do not insist on taking your dog inside. The smarter way out is to simply find a dog friendly park. These parks allow dogs under voice control to be taken off the leash. Do not take your dog to such a park unless you have trained the dog well to obey your commands. If you have a pup, use a ten foot long leash to train the pup to come back to you when you call it. If the pup refuses to obey, use the leash to keep it under control. 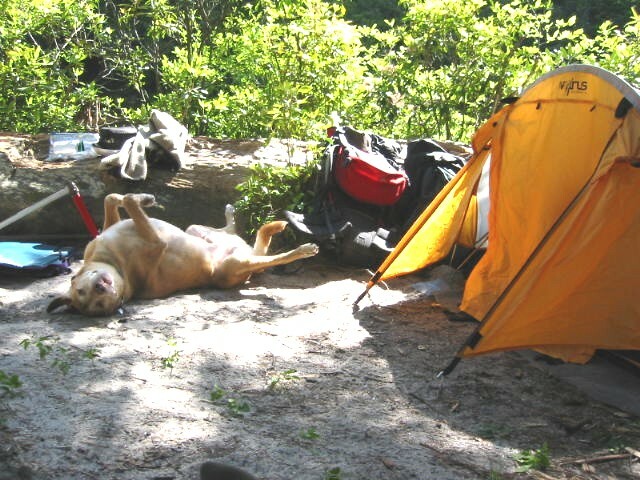 …or get the latest from Best Hikes With Dogs via email!